The Colors Of Indian Cooking: For Chocolate Lovers Only...Flourless Chocolate Cake With Pomegranate Sauce. When I was planning my POM Wonderful dinner, the question of dessert was something I worried about a lot. Recovering from dental surgery, I found myself cruising around the internet while planning the menu, just in case I was chosen. I was intrigued by a classic dessert, Floating Island. This Victorian era stunner consists of a soupy sort of creme anglaise pudding with little meringues or sometimes one big meringue floating on the top... ergo the Float in Floating Island. I was planning on doing this dessert with a saucy dash of pomegranate sauce. Oh, I was feeling saucy alright. I was on two different antibiotics, vicodin and a diet of Ensure and here I was signing up to make this insane dessert that I'd never even had. What's wrong with this picture? Try everything. Then I was selected as one of 100 people chosen to host a POM Wonderful dinner. Things got real serious, real fast. I thought I'd better give a little more thought to my dessert plans. First of all, what did I know about Floating Island outside of a few Mary Poppins books I'd read as a kid and a late 19th century cookbook I'd once gotten my grubby mitts on? Zilch, zero, zip. After all it's not like it's something anybody finds on a menu anywhere anymore. I decided if I was going to serve this dish, I'd better like attempt it first. Like a dress rehearsal. The results? You be the judge. But wait! It gets better! Here I am fishing them out. To put this in Broadway terms... my dessert closed out of town. After spending three days simmering and steaming meringues I decided to change my plans. I was looking for something that would go beautifully with the gorgeous pomegranates the POM Wonderful people had sent me. I decided on a rich, dark, flourless chocolate cake. I'd run across a recipe from Williams-Sonoma that looked perfect. Now I 'd never made one of these either, but I sure as hell have eaten it and I loved it. It turned out to be a lot easier than I thought it would be... no rehearsal necessary. I started with an 8 inch spring form pan. It turns out I'd bought one of these a few years ago, tucked it away in a cupboard and had forgotten all about it. Who knew? Take the 8 inch pan and grease the sides and bottom with butter. Then cut a piece of parchment paper to fit the bottom of the pan, and place it inside. Sprinkle it with a bit of flour then tap the excess out. Meanwhile preheat the oven to 375 degrees and while it's heating up, it's time to prep the base of the cake. Chop up 8 oz of bittersweet chocolate. Just a note here about the chocolate. You can use any sort of bittersweet chocolate you wish, but I always find that the better the chocolate, the better the flavor. I used Valhrona chocolate for this cake. Cut 1 stick of unsalted butter into pieces. Mix the chocolate and butter together in large bowl set over a pan of simmering water. Stir them together until they're melted. When everything is melted together, set it aside to cool for a bit. Seperate 4 eggs. Make sure they're cold right out of the fridge. Whisk them together until they're just blended. The pour the yolk mixture into the chocolate mixture and blend it all together. set on medium, beat them together until it's all foamy and the cream of tartar is blended in. About a minute. Turn it up to medium high until you have soft egg white peaks. About 3 minutes or so. Add in 1/4 cup of sugar a bit at a time. Beat until the egg whites are shiny and stiff. Fold the shiny stiff egg whites into the chocolate cake base until everything is combined. Pour the batter into the prepared pan, smooth the top of the cake and bake until the cake puffs up. The top should be firm and if you wiggle the pan a bit it juggles in the middle. It should take about 20 to 25 minutes. Set the pan on a wire rack to cool for about 30 minutes. The cake will sag a bit in the mid section... but don't we all? After about 30 minutes, run a thin knife around the rim of the pan and pop the sides. Let the cake continue to cool for another hour or so. Now for serving the cake. Slip a thin knife or spatula under the cake and slide it onto the serving platter. Mix all of this together over a medium heat until it thickens and starts to bubble. 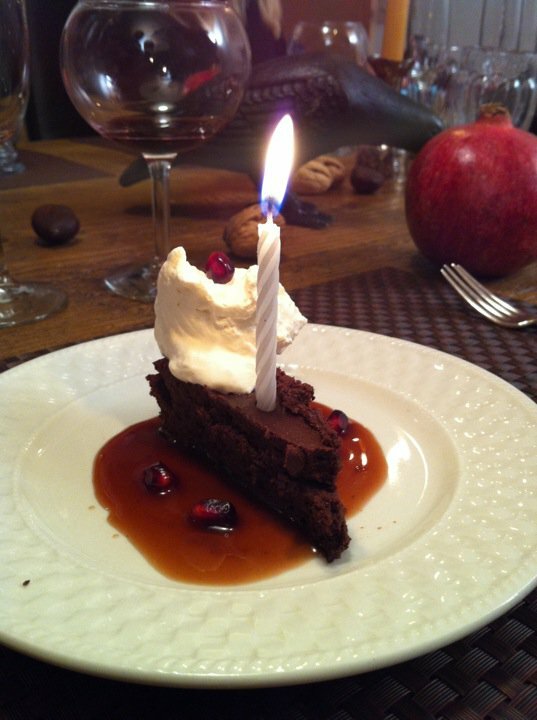 To serve the cake, ladle a pool of pomegranate sauce onto the plate. Place a slice of cake into the center of the pomegranate sauce. So if you're looking for a change this Thanksgiving from the usual pumpkin pie, let them eat cake! Unfortunately, I've already ordered my pumpkin pie from a local bakery because baking is not my forte :) And, we are all chocolate lovers and would love to eat cake - esp. this one - so I'll bookmark it for Christmas dinner! Congrats on being chosen as one of the 100 - the flavor of POM syrup is a perfect complement to the rich chocolate. Mmmm, how delicious! Great recipe, it sounds scrumptious! Have a wonderful Thanksgiving holiday, Kathy! Great job. Just for the record though...I thought your floaty thingies were cool looking. the floaty thingies weren't bad tasting I was just concerned about the overall reception..I think I am actually going to have to really make this dessert. It was quite popular in the Raj. Yes, it was great. I mainly use Valhrona unless I can find Callebaut (rarely in Sonoma). We served it with a Syrah which everyone but me (I don't drink) said was amazing. Yes, I think a return to the Floating Island of Lost Souls is warranted. 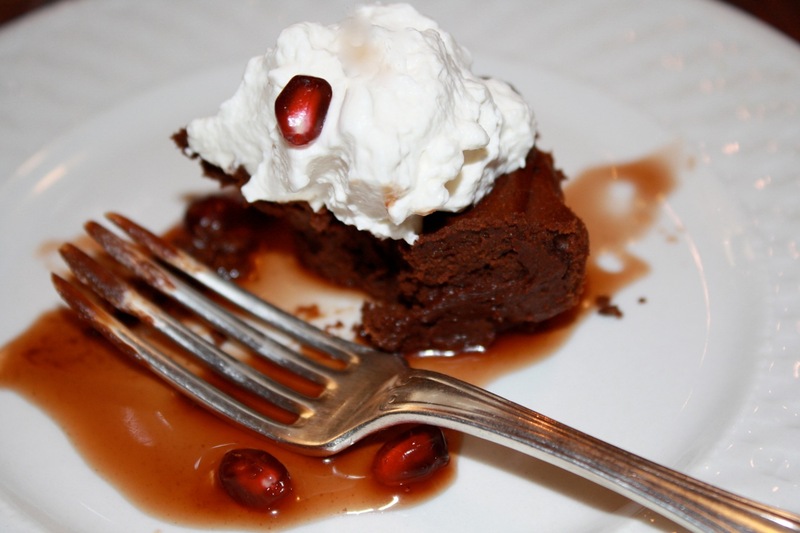 This flourless chocolate cake with pomegranate sauce looks mouth-watering! Thanks for the recipe. That looks terrific... amazing what we all did. Pom got a nice bit of advertising, but we had all the fun! I've tried one flourless cake. I was told it looked and tasted like it should have but it really didn't remind me much of cake. This was the first one I've made and it was very dense and moist almost a cross between cake and mousse and the intensity of the dark chocolate I used was offset by the sweetness of the pomegranate sauce. I've had the other kind of flourless cake which is usually made of ground nuts and chocolate and has a drier cakier texture. I would not think twice about serving this for Thanksgiving instead of the traditional pumpkin pie! I am intrigued by the pomegranate sauce...love its tangyness (I hope it's a word). Looks delicious!!!! This is a recipe I would love to try! !